The very first time I entered the famous Johnny Rockets, located at 1411 Adetokunbo Ademola Street, Victoria Island, was to meet a friend and her cousin. 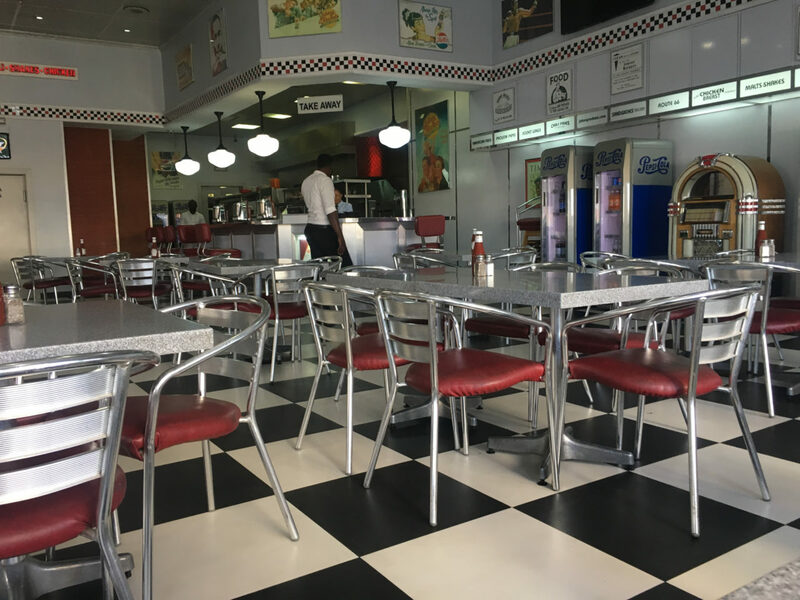 I loved the classic diner vibe as it transported to an old movie with Marilyn Monroe. On a fateful Wednesday afternoon, I tried the celebrated Johnny Rockets burger which has been rumoured to be the best burger in Lagos. Inspired by the good folks at Eat.Drink.Lagos, I ordered the Smoke House single burger which comprised of thick-cut smoked bacon, crispy sourdough onion rings, Cheddar cheese and their special ‘Smoke House’ BBQ sauce. I also requested for a side of fries as they don’t come as a package. My order came in good time and I was underwhelmed with the size of the fries and the burger. Then again, they are in the heart of Victoria Island and word on the street is that they import most of their ingredients. As I looked at my N4,200 burger and N1,000 fries, I mentally prepared myself for the experience. The fries were very crispy and soft on the inside. One bite into the burger and the different flavours from the crispy bacon to the onion rings swayed me. Every ingredient in this burger was made to perfection. The buns were soft, but not too soft that the ingredients melt into it. The cheese was heavenly and the bacon, onion rings and beef patty were well done. Although the ingredients of the burger complemented nicely, I had expected the special Smoke House BBQ sauce to flourish but it lacked that extra ‘smoke’. Will I be heading back to Johnny Rockets? I actually do not know. The damage done to my wallet will need time to recover and it is not also sustainable to visit for frequent lunch dates.